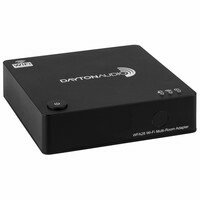 The small and powerful Dayton Audio DTA-120 Class D amplifier installs virtually anywhere. It produces big-amp sound while occupying minimal space on your desk or A/V cabinet. Dayton Audio has revamped the popular DTA-100 mini amplifier with an all-new design that improves on every part of the DTA-100's performance. 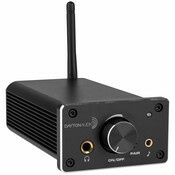 The result is the Dayton Audio DTA-120 Class D digital amplifier. It's everything you need in a mini amp, delivering the performance of enormous hi-fi gear, and smart features you'll wonder how you lived without...and thanks to the space-saving design, it fits and installs practically anywhere! 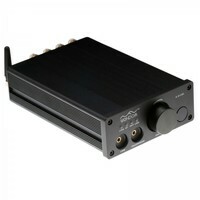 The DTA-120 amplifier delivers the power of a monster amplifier, but in a tiny package. Thanks to Tripath's proprietary Class D technology, plus a robust Dual Parallel BTL configuration, the DTA-120 tackles the toughest speaker loads with ease -- while delivering the sound quality and low distortion of a conventional Class AB amplifier. The dual-power-chip design delivers 60 watts (RMS) per channel of efficient power into an 4 ohm load (up to 120 watts total), and 40 watts (RMS) into 8 ohms – continuously, with no reduction in output. That means powerful bass and clear output that keeps on going, even with the most demanding speakers. With the DTA-120 amplifier, you get the most power possible from the smallest footprint imaginable. At under 3-1/2" wide, 2-1/4" tall, and 6" deep, the DTA-120 delivers more power per cubic inch than any other mini amplifier. All this is thanks to the revolutionary, cool-running Class T digital PWM amplifier technology and the extruded aluminum heatsink case. The robust external switching power supply hides out of sight. 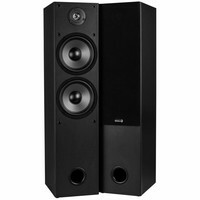 But since it can supply high current with even higher peaks, the DTA-120 can easily drive HUGE speakers. Specifications: • Output power: 40W RMS x 2 @ 8 ohms, 60W RMS x 2 @ 4 ohms (10% THD max, both channels driven) • Total harmonic distortion (THD): <0.1% @ 1W • Frequency response: 20 - 20,000 Hz (+0/-1 dB at 8 ohms, +0/-3 dB at 4 ohms) • Signal-to-noise ratio: 103 dB, A weighted • Input sensitivity: 750 mV (full volume) via rear input • Inputs: Rear stereo RCA, front 3.5 mm stereo mini-jack • Outputs: dual shielded, gold-plated mini binding posts (banana plugs accepted) • Power supply: Input: 100~240 VAC, 50/60 Hz, 1.6A (192 Watt @ 120VAC); Output: 24 VDC, 5A continuous, with 2.5 mm DC plug • Power efficiency: >85% • Dimensions: Faceplate dimensions: 1-29/32" H x 3-3/8" W x 5/16" D • Body dimensions: 1-3/4" H x 3-1/8" W x 4-5/8" D • Overall dimensions: 2-1/8" H x 3-3/8" W x 5-1/2" D (including feet, faceplate, and volume knob). Blue power LED indicates the unit is receiving power and is fully operational. This control turns on the unit and adjusts the volume level of the amplifier. When the unit is turned on the power LED will become fully illuminated. To turn the unit off, turn the control fully counter clockwise until it "clicks" to the off position. It is normal for the power LED to slowly dim and then go completely out when the unit is first turned off. The DTA-120 also doubles as a headphone amplifier that will drive any headphone easily and delivers colossal sound stage and effortless dynamic range. The 1/4" stereo jack allows connection of larger home and studio-style headphones. An adapter is also provided so that smaller 3.5 mm personnel style headphones can be used. Note: When headphones are plugged into the headphone jack the speaker output connections are disconnected. Use this button to pair (and unpair) devices for Bluetooth audio streaming. When the amp is turned on, it will automatically be in the pairing mode, as indicated by the power LED flashing slowly. At this time, you can pair the DTA-120BT by selecting it in the Bluetooth menu of your mobile device. To unpair and connect to a different mobile device, press the PAIR button on the DTA-120BT to re-enter pairing mode. When initially powered on, the DTA-120BT will attempt to connect to the first available device that has been previously paired. Bluetooth connection will take priority over any other input source. The unit features a convenient front mounted 3.5 mm stereo input for quick connection of iPods, MP3 players, and other portable audio devices. A 6" 3.5 mm coiled cable that stretches to 12" is included. Note: When a device is plugged into the 3.5 mm audio input the rear mounted RCA input jacks are disconnected. This allows the user to permanently connect a device to the rear RCA audio inputs and switch to a portable device by simply plugging into the front mounted input. Turn this antenna to a vertical position prior to using the Bluetooth feature of the amplifier. 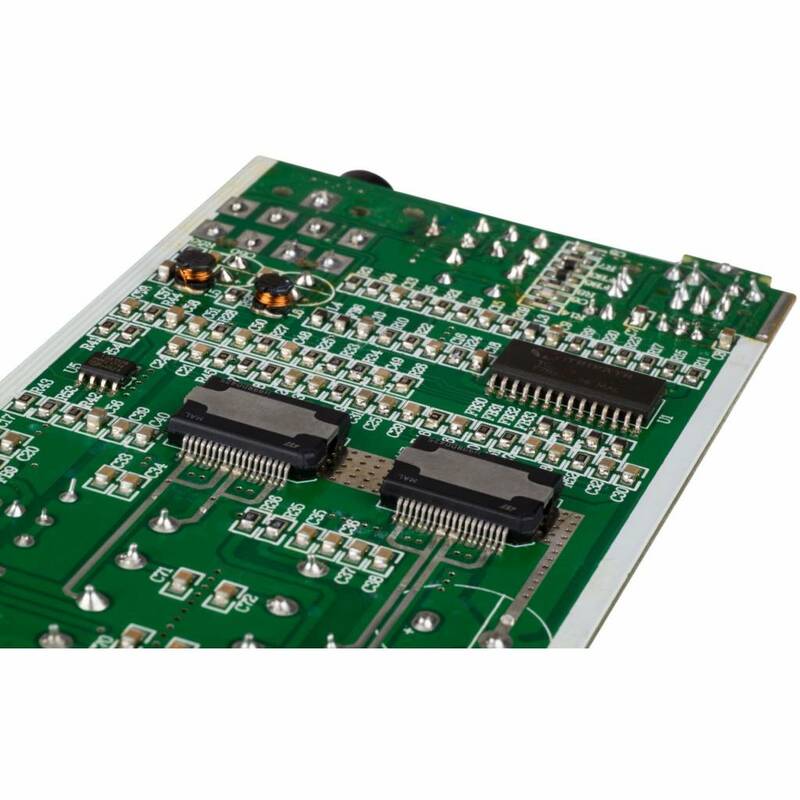 The DTA-120 operates on 24DVC and MUST be used with a power supply that can provide at least 5A. A world compatible (100V-240V) switch mode power supply is included with the unit and is supplied with a U.S.A. or EU style cord. To operate in other countries an appropriate power cord will need to be purchased. The power connection on the unit is a 2.5 mm x 5.5 mm jack with center pin being positive. Note: If an inappropriate power supply is used and the unit is damaged, the warranty will be voided. 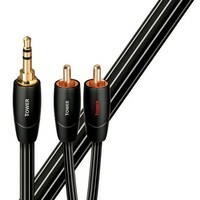 The speaker output connections utilize high current binding posts that are spaced on 3/4" centers and are compatible with standard double banana plug connectors (sold separately). The connections are color coded for easy polarity identification. High quality screw-on banana plugs that will accept 10AWG-18AWG wire are included. RCA-type line level input for permanent connection of larger devices such as CD players, PCs, and DVD players. An RCA to 3.5 mm adapter is also provided for added connection flexibility. Note: When a device is plugged into the front mounted 3.5 mm input, the RCA input jacks are disconnected. Excellent product. Very well made. Excellent little device, does the job. I'm very happy, clear sound. Nice price. It's great, exactly what I needed to get my old speakers booming again. Bought this for daily use and it works great. I paired them with a set of 4 B652-AIR. works perfectly! 1 woord uitstekend, Ik gebruik hem voor de seround back speakers. goed geluid, mooi compact en prima geschikt voor het doel waar ik hem voor gebruik. er is een klein na deel. het ledje wat er op zit is heel vel. De aankoop van mijn DTA is geweldig !! Zeker 5 sterren, compact en een geweldige geluidweergave. Het led lampje zou iets minder fel kunnen maar met een beetje nagellak is dat zo verholpen. Zeker een aanrader voor als je overstapt op DAB.